Yesterday afternoon we got to have a much anticipated afternoon on the farm. After church Travis and Gina took us up to Gina's family farm for some countryside education. I think the idea got sparked one evening several months back when we were all playing with Perry and his Little People farm set. Perry handed me the yellow trough and I called it a "food container." Let me be clear...I do actually know the word trough...but it was not on the tip of my tongue at the time...and I sounded very much like an uninformed city girl. We have been trying to find a good weekend to go up to Ardmore to meet Gina's family and see the farm, and cows, and tractors and have some old-fashioned outdoor fun. We had a great lunch with Nina and Dennis, Gina's parents, and then all piled in the golf cart to go down to her grandparents house to see all the tractors. 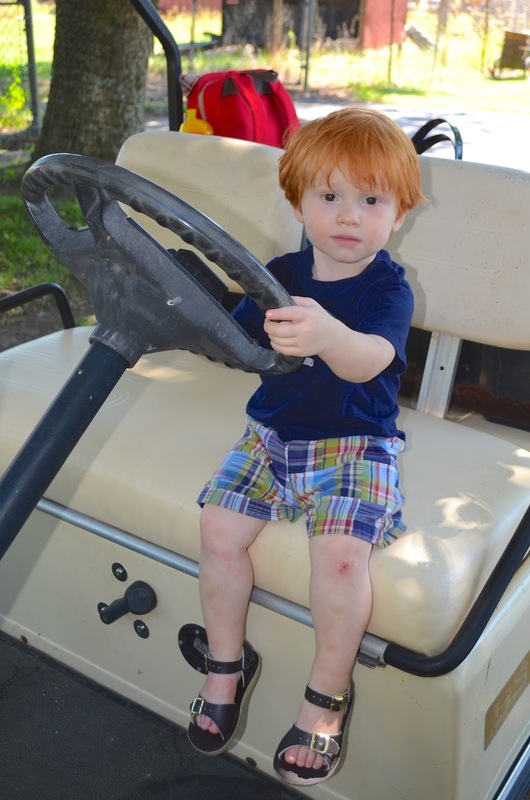 Perry's got a little growing to do before his feet will reach the pedals of the golf cart. Doesn't that family look like they belong on the farm? lol. 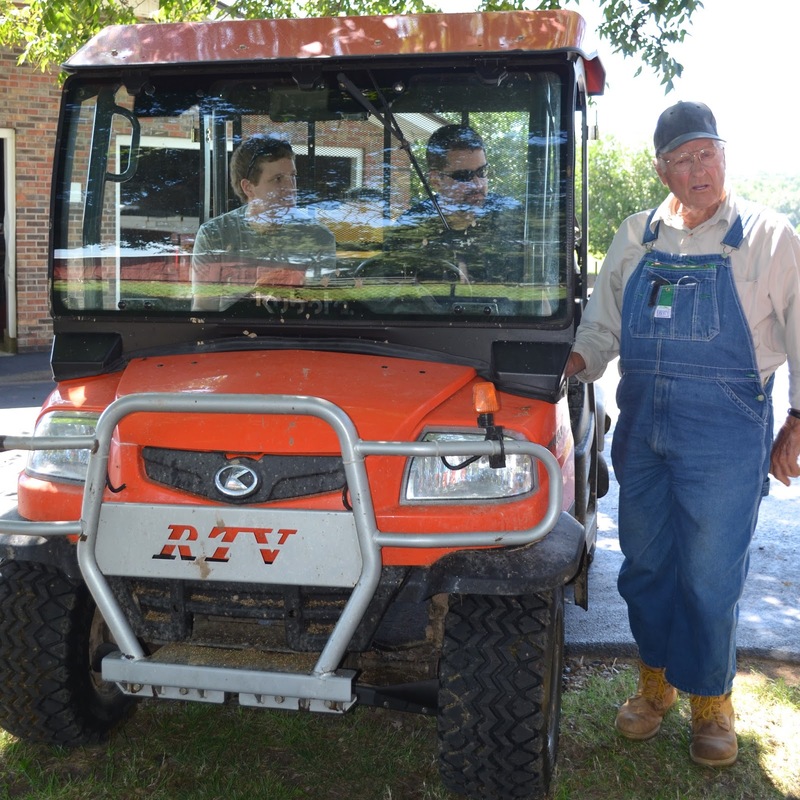 We took the Kubota out for a ride to look around the land and see the cows. There were a few baby cows who were just a couple of days old. So cute. Perry liked the cows. 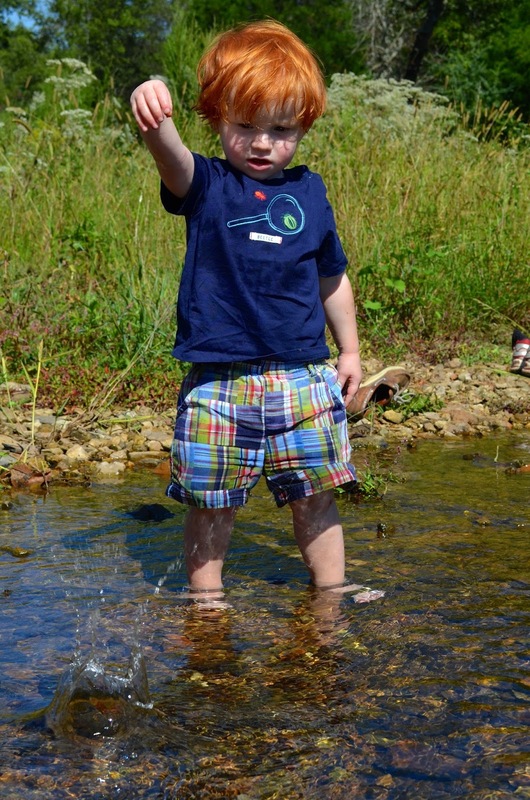 But his favorite part of the day was stopping at a shallow creek bed to play in the water and throw rocks. Teaching that skill may come back to haunt us one day (thanks Travis :)). But he had an absolute blast and was totally soaked by the end. He was so sad to have to leave the creek and cried and said "bye bye rocks (see last picture below)." No question that he is all boy. It was an awesome afternoon. We were all glad that scheduling forced us to put the trip off until it was almost fall because the weather was perfect. Warm, but not too hot. We loved getting to spend a few hours away from the hustle and bustle and out in God's creation.